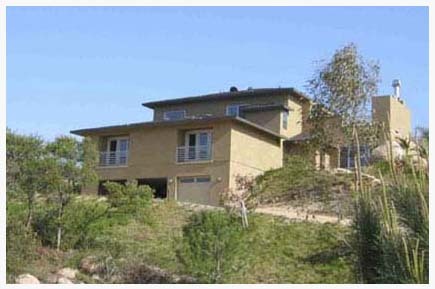 "For those of you who might have missed me when I didn't answer my phone or do readings for 4 years, here is the story and photos of construction of our energy efficient, environmentally cool home on our land in De Luz, in southern California." 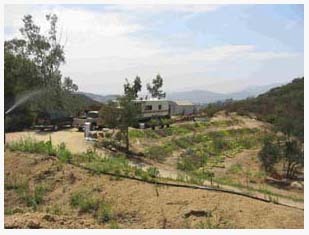 In January of 2002, Ro and I bought 18 acres of land in a canyon behind Camp Pendleton called De Luz, about half an hour from both Fallbrook and Temecula in southern California. It backs up to BLM land on 2 sides so it lives big, quiet and private. We choose to live on the land while building the house Frank Lloyd Wright always had his students live on the land their first semester in order to get familiar with the wind, the light, the movement of the celestial bodies. After the first big storm we had our doubts about choosing the top of the ridge where we put the trailer. In the distance is the ocean but it's 12 miles away so it's the far distance. 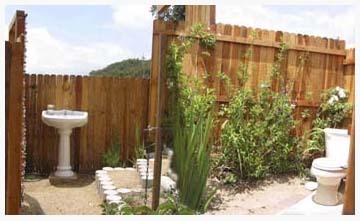 We built an outdoor bathroom, actually we built two. The first is out on the point near where the trailer was situated. It's hooked up to the septic system and it has passive solar hot water in the shower. The shower room has the same views. At the entrance to the bathroom is a chain to pull across for privacy. 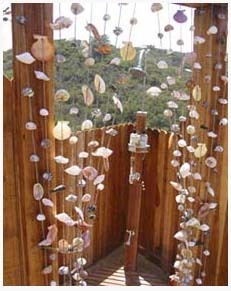 There is another outdoor shower/toilet beside the back entrance to the house - great for gardening! 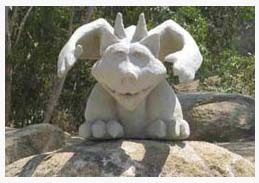 In building the house we choose to use Rastra, a recycled cement and styrofoam material. It's fireproof, 700x's better sheer strength in an earthquake than conventionally built houses and it's very well insulated both to sound and temperature. We built a 1,200 sq. ft. house as a prototype on the far side of the land it's now rental although some day we might use it for retreats. Ro and I designed both homes, we needed to hire and engineer because of the local code but Ro drew the plans and I built the houses, did the electrical, plumbing and pretty much everything else except tiling, Ro does that (beautifully creative!). 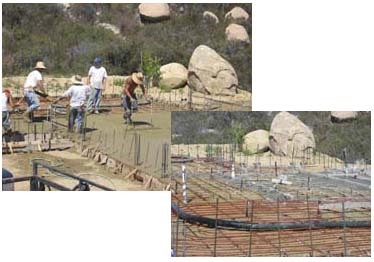 We used tubing in the cement slab, it will allow solar heated water to run through all the floors in the house. It will keeping them warm even in the winter when we have the pocket sliders open. The concrete slab was colored and stamped to give it the texture of stone. The floor was then finished with more color and a sealant. They are beautiful, cool in the summer and warm in the winter and they are easy to keep up. We have solar hot water for the showers and kitchen and a large bank of photovoltaic panels which generate our electricity. We are on the grid, meaning we hook up to the local power, by doing so we were able to get great rebates and we can share. When we are making more power than we can use they take the extra and buy it back, at night or on cloudy days we use their power. It's should be a draw. Hopefully we will generate about as much as we use. The fireplace is flanked by two large granite rocks from the hill top. The rocks weighed about 5 tons each. Our tractor guy Tim was surprisingly enthusiastic about moving them inside. 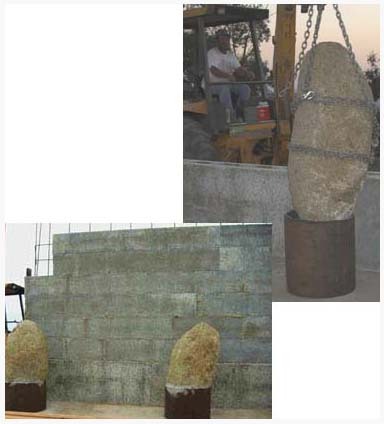 About a third of the rock had to be buried in concrete. Holes were drilled in the back and steel rear was epoxied in. The rebar was then bent and tied in to the steel in the wall, then the walls were poured with cement. 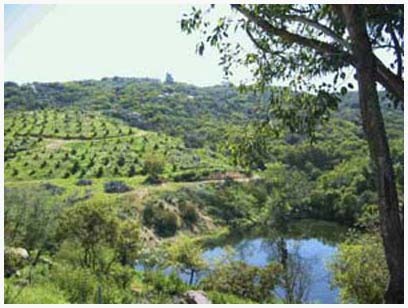 We planted a 5 acre avocado grove, it's certified organic. The pond is spring fed. It goes dry in drought years but when it's full Ro swims in it on hot afternoons and sometimes I join her. Ebony our dog likes to herd ducks. Duck herding is not easy.